The Catalan Minister for Digital Policy and Public Administration, Jordi Puigneró, and the Prime Minister of the Faroe Islands, Aksel V. Johannesen, the Deputy Prime Minister, Høgni Hoydal, the Minister of Finance and Digitalisation, Kristina Háfoss met this morning at the government headquarters, Tinganes, in Tórshavn, the capital of the Faroe Islands. The two governments have reached a collaboration agreement between the respective administrations and ministers Jordi Puigneró and Kristina Háfoss in order to define a joint programme and collaborate in developing government policy in the spheres of e-governance and the digital economy. The parties agreed that digital development is one of the keys to generating inclusive economic growth, and that administrations need to provide effective public services that can operate at maximum efficiency. In addition to the matters outlined in the agreement, they have tackled other issues of mutual interest, such as the drive to create a digital identity for citizens, and cybersecurity issues. The agreement envisages an exchange of information, experiences and solutions in these two spheres of action between Catalonia and the Faroe Islands, as well as the organisation of joint events and business missions and advisory processes, in addition to their participation at international conferences and visits, among other initiatives. 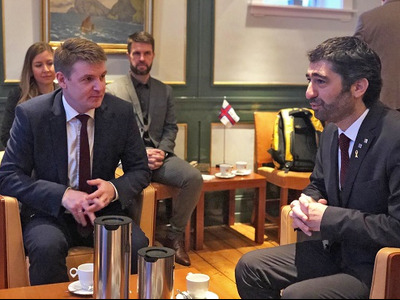 During the official visit of Puigneró to the Faroe Islands, the Catalan minister also visited the Parliament of Faroe Islands and the public ICT administration Føroya Gjaldstova, which houses the National Digitalisation Programme of the Faroe Islands. His itinerary also included visits to the largest Faroese telecom Føroya Tele, the Telecommunications Authority of the Faroe Islands, the Power Company SEV, the Sub-Sea tunnel company, the University of the Faroe Islands, a start-up hub, representatives for the Faroese IT industry, and the Faroe Islands Parliament. Among the people Minister Puigneró met were the speaker of the Faroese Parliament, Páll á Reynatúgvu, the mayor of Tórshavn the capital, Annika Olsen, and the head of the House of Industry of the Faroe Islands, Marita Rasmussen. The two territories will share information and know-how on how to create a modern digital infrastructure. They have also agreed to work together to promote the presence of women in the ICT sector and their participation in the digital economy. An agreement has also been reached to undertake joint initiatives to carry out pilot projects in areas related to digitalisation, 5G and digital start-ups.